Bihar Police SI Online Form 2017 – Bihar Police Sub-Inspector Online Application form at www.bpssc.bih.nic.in: Looking for Bihar Daroga Online Form? 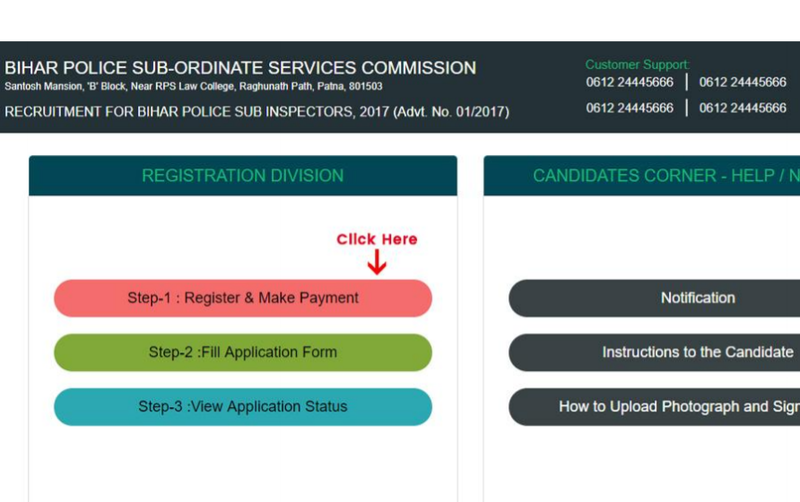 The Bihar Police Sub-ordinate Services Commission (BPSSC), Government of Bihar has invited Online application from candidates across the state for conducing Written examination & Physical Test for filling up 1717 Bihar Police Sub-Inspector (SI) vacancies. Bihar Daroga Online Registration Started for Police Sub-Inspector posts. Bihar Police Department has started accepting online application form for the recruitment of Bihar Police Sub-Inspector (SI) posts. At bpssc.bih.nic.in, Online form for Bihar Daroga Vacancy is available to apply. As per the Bihar Police Eligibility, Suitable & Physically fit candidates can apply at Bihar Police Sub Inspector posts on or before 30th November 2017. Bihar Government has started appointment of Police Sub-Inspector (SI) posts in Bihar Police Department under Bihar Police Sub-ordinate Services Commission (BPSSC). Online Application form for Bihar Daroga has been started filling from 24th October 2017. Follow the instructions explained below which will let you apply online for Bihar Police Sub Inspector Exam 2017. All those candidates who wish to apply for Bihar Police SI posts in Bihar Government through Bihar Police Sub-ordinate Services Commission (BPSSC), they are now required to apply online for Bihar Daroga on its official website at http://bpssc.bih.nic.in. In order to apply for Bihar Police SI (Daroga) vacancy, candidates are required to visit official website like other competitive examination. We have come up with each and every detail about Bihar Police SI Online Application form and how to fill Bihar Daroga Online form. Step-1 : Registration & Payment. Step - 2 : Fill Online Application Form. Step - 3 : View Application Status. Education Certificates (10th/SSC/Matriculation, Graduation, Post-Graduation [optional]). Address Details (Aadhar/Voter ID/Driving License/Passport/Ration Card/Birth Certificate)(Also have Details of nearest Post Office and Pin Code). You should have a scanned copy of your recent Passport Size Photo in jpg or png format. Have a scanned copy of your signature in Hindi and English both on white paper. Visit BPSSC Online website at bpssc.bih.nic.in. Click on "Apply Online for the post of Police Sub Inspectors in Bihar Police." Click on "BPSSC Online Application"
Now Click on "Register & Make Payment" link. Fill All required details i.e. Name, Mobile No., Email, Category, Gender, Domicile etc. Click on Proceed button to Make Payment. On confirmation of payment, Registration ID will be generated. After getting Registration ID click on "Fill Online Application form" link. Enter all required details i.e. Personal details, Educational details, Address details, Photo & Signature etc. Click on Submit Button on completion of application form. An acknowledgement page will be open. Click on Print Acknowledgement to take print out of Application form. Note: The applicant shall submit only one application form for the Bihar Police SI posts.